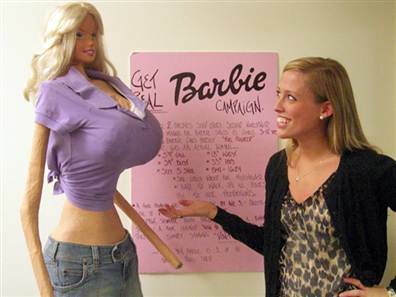 Every so often someone wonders what a barbie would look like scaled up to real human size – the answer: pretty wrong. It’s an informative exercise in feminism and the body image that we’re giving to little girls. According to some BBC research, a real life Barbie with a normal size 10 waist would be huge, 2 inches shorter than the world’s tallest woman and would have a bust size of 37inches. The BBC did a mock-up on a photoshopped human but a model produced by an American artist who has just been interviewed on MSBNC does a better job of showing how gruesome barbie would be if she scaled the proportions up to a natural human height. That’s it above, with the creator Galia Slayen. The artist has admitted that the figure isn’t 100% correct which is a pity, I’d actually like to see one that was. But she maintains that it is valid extension of what Barbie would like, big. The only thing that this image proves is that who ever did the model doesn't do very well in maths. The doll should look proportionally the same whether it is life size or not, and clearly, this doesn't. Not to say Barbie is normal in her proportions, but she's not THAT bad… Not even close. There’s not important if you are good or just bad student, anyway, you will need the high quality term papers examples to show your writing technique. Usually, college students use the essay service, which can make out tasks of every complicatedness. that been uncovered and you did it so well, with so much class. Good one you, man! Really great stuff here. network that travels on copper, is to make life easier. That “artists” barbie is NOTHING like the original doll. jesus you guys must be scraping the barrel. look at it’s stick arms wtf, get grip people this is nothing like the barbie. she is one slap dash artist for sure i’m amazed you gave her any publicity at all. terrible skills.